Here is your invitation to the GXSA Rally on June 28th, where we will be guests of Chichester Yacht Club, in their brand new building at Premier Marina, Chichester. We're looking forward to a sunny weekend, some interesting sights around the beautiful Chichester Harbour Nature Conservancy, and a rendezvous with friends at Premier Marina. Rally regulars will be familiar with the social format, which comprises the normal Pontoon Party, followed by dinner in our private room, in the Club House. If you've not been to a GXSA Rally before, COME ALONG - We're sure you will enjoy yourself. Everyone is welcome. The closing date for signing up, with menu choices, is Monday 14th June . The price is £25 per person to include Drinks, Nibbles, and Conversation at the Pontoon Party, followed by dinner. Mooring fees are extra, payable directly to Premier Marinas, when you get there. The £25 can be paid by cheque payable to GXSA, or via online banking to the GXSA bank account, referencing your name and "Chi". 1. The United Nations Educational, Scientific and Cultural Organization (UNESCO) has requested participation in their initiative to commemorate the event that triggered the First World War on 28 June 1914. In this context, UNESCO has requested that on 28 June 2014, all vessels at sea, if practical, to fly ship's flags/ensigns at half mast, to indicate mourning in remembrance of the Centenary of World War I.
UNESCO has further requested that vessels moored in harbours use a remembrance sound signal on the same day at 1700 UTC being the hour of the first shot fired in the conflict, to commemorate the Centenary. 2. Chichester Harbour Conservancy supports this initiative and authorise the Masters of all vessels moored in the harbour to sound ONE PROLONGED BLAST at 1800 BST 28 June 2014. 3. Byelaw 23 (Sounding of Sirens) will not be enforced during this event. Thanks to Gerry Knight and John Rugg for pointing this out. Provided that the weather is kind to us, I've found a short walk to burn off some of the liquid-calories from the night before. It will also give you something to do whilst waiting for the tide to turn, for that fair run home. If you'd like to join me for a short walk on Sunday morning, I found this walk from Chichester Marina to Dell Quay, and back. As we would skip the first part (from the road to the marina), it's probably approx.3 miles, so should take less than a couply of hours (if we amble along). So far we have confirmations from the following people & boats. Please let me know if you would like to come along, as well. We've chosen a homely menu for this rally... hence the bargain price of only £25 per head. SKIPPERS: Please call the lock keeper on VHF 80 when you are approaching the marina to receive locking in instructions, and guidance on where to berth. The marina is hoping to get us all located near one another. Access across the entrance to Chichester Harbour is recommended at HW±3. reach back on Sunday in F4-5. Very enjoyable pontoon party and dinner. Our thanks to John Gorrie for organising this rally. 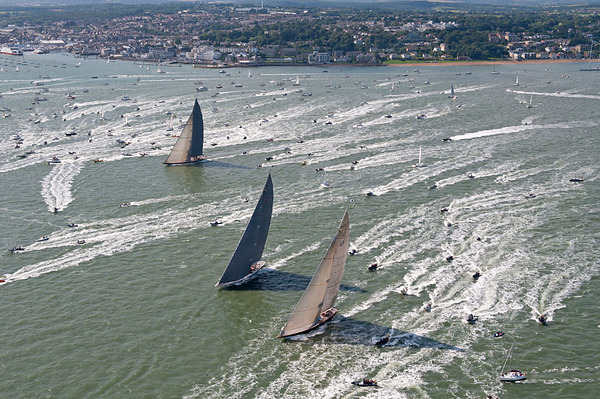 The J Class were invited to take part in the RYS International Bicentenary Regatta in Cowes. They were berthed at Ocean Village and racing was from the RYS Line. This will follow on from a J Class Regatta in Falmouth. GXSA had several boats on-the-water to marvel as these impressive yachts sail around the Solent. The foiling AC45 catamarans visited Portsmouth this year in practice for the America's Cup competition which takes place in 2017. This week marked an unprecedented opportunity to see the world's best monohulls (J-Class) and Catamarans (AC45) on the water at the same time. Numbers are now being firmed up for our 3rd rally, at Gins Farm RSYC on the picturesque Beaulieu River in the New Forest. This rally is open to all GXSA members - If you want to bring friends or family, all are very welcome! £30 each to GXSA. Plenty of sightseeing and the New Forest ponies! Meet at Gins Farm walk ashore pontoon Saturday 16th September. GXSA has reserved 8 berth spaces - all boats will be close by. Pontoon party starts at 6pm – Prosecco, Gin & tonics, nice wines, chilled beers and of course there will be some tasty bites to eat! 7.30pm Dinner at Gins Farm / 3-course dinner, tea & coffee. Sunday – Walk along the river bank - Bucklers Hard. Special note for ‘Non-boaters’ Ever thought it would be nice to meet up with everyone and enjoy an excellent evening dinner ? Good company without all that messing about ! Why not drive down and stay in a nice local hotel in the heart of the New Forest ? All ‘roadies’ very welcome! Tickets are valid for ANY one day of the Show including Preview Day on Wednesday 10th January. Tickets can be ordered up to MIDNIGHT on Tuesday 9th January. A single transaction fee of £1.95 applies whether ordering one or more tickets. Tickets are only available as ‘Print at Home’ via the London Boat Show website. Click on BUY TICKETS at top of homepage. Enter and submit Promotional Code. This will bring up the ticket ordering sequence which is straightforward to follow. You may be asked to select the day you expect to visit. This is merely to help the organiser predict visitor numbers for logistical purposes. The tickets you receive will be valid for ANY single day including Preview Day. A bus took us from the Memorial Centre, Gerrards Cross at 08.30 on this day trip and returned us there about 19.00. The trip cost £28, which covered the cost of the bus, all admissions and the cocktail at the end of the Gin Distillery tour. In the morning, 20 people were first be dropped off to visit the new NMOC Coastguard centre near Fareham (10.30 - 12.15). After that visit they joined the rest of the group at Fort Nelson for lunch. Those people not going to the Coastguard were taken to the Armouries Museum at Fort Nelson, near Fareham. This recently updated museum has excellent displays, a very large and interesting site on Portsdown Hill and fine views over Portsmouth Harbour. In addition to the large area of restored tunnels and ramparts, there are many varied exhibits on miltary life through the ages and a wide variety of artillery is on display. Interesting contemporary items include part of the Saddam Hussein supergun which was intercepted during the gulf war. About 14.15 we all departed on the bus for Laverstoke Mill, Bombay Sapphire Distillery. We had the Discovery tour of the distillery, which includes a choice of cocktails for you to enjoy.There is an impressive glasshouse which produces the specialised botanicals that are used to flavour the gin recipes, an exhibition on the production of gin and the distillery itself. Another pleasant day drip for the GXSA membership, ably organized by our Chairman, Bernie Smallman. In this article I’m going to cover the Day Trip, and provide some interesting educational articles about Sail Trimming that we can all use to improve our technique, and make our sails last longer. North Sails are one of the world’s leading sail makers, with many significant racing crews and events amongst their customers. North make the sails for America’s Cup, Volvo Round the World Race, and many One-Design Dinghy classes, together with fitting out many of the individual yachts entered into global yacht races, such as Antigua Week, Sydney-Hobart, and Cowes Week races. Also, 80% of their business is making, repairing, and renovating sails for cruising boats, like you and I sail every weekend. North are very proud of their sails, and their website contains lots of educational tips about how to get the most out of your sails, by tuning each of the strings that you probably hardly ever touch! Several GXSA members are regular, and occasional North Sails customers, which led us to persuade David Swete of North Sails to host a trip around their new sail loft facility in Fareham, followed by a detour to Portsmouth and up the Spinnaker Tower to see the view over Portsmouth, Gosport, and the Isle of Wight. If you currently have sails, that are getting a bit old and baggy, North reckon that there is a good chance that they can renovate them by re-cutting. They suggest that you send photos of your sails, “at‑work” to their experts who will be able advise the optimal way forward. Just contact North Sails in Fareham to get the ball rolling (023 9252 5588). All sails are a compromise of these features and materials. North have been building 3D laminate sails for 25 years, and they claim that their new(ish) 3Di technology is 25 years ahead of any competitor’s product. They reckon that 3Di is a market-beater, so watch this space (spoiler alert: I bought some – currently awaiting delivery; March 2018). There are lots more guides on the North Education website. The day started with a 9am (early for some) departure from Gerrards Cross on a very comfortable Heyfordian coach. At 10:30 we arrived at an un-presupposing industrial unit on Fareham Industial Estate, for refreshments in the staff canteen, and use of the facilities, before the tour began. Our first stop was their huge sail-making table – North believe that there are only 2 like this in Europe. Imagine that you have a sail from a 15m mast (which isn’t that big, really). That equates to a huge piece of fabric. Traditionally, this has meant manually dragging the sail across the floor and through the sewing machine, with lots of room for error when the sewing machine stitches the fabric. On the North system, the fabric stays still, and the person/sewing machine move on a conveyor belt that is geared to the feed-rate of the fabric through the machine, so each stitch is exactly the right size and tension for the fabric being sewn. For curved seams (eg. Around tack, clew, or head) they have a moving sewing machine that moves on an arc, again geared to the speed of the machine, making perfect stitches. Then we moved to the main sail-making table. This looked to be the size of a football field, and filled the warehouse. I’m not sure what is the biggest sail they could cope with, but there were TWO sails from 100ft yachts on the table at the same time, and LOTS of room to spare. Frankly, this is where the Sail Sales bit took over, as we got to touch/examine/caress/fondle an example of the North 3Di Nordac cruising sails. These are custom built from polyester (dacron) on a mold to a perfect aerofoil shape, with the fabric-thickness depending on the stress/load for each specific area of the sail (North believe that these are the cruising sails of the future). Here’s a YouTube video about how 3Di sails are made. The effect on the GXSA tourists was quite bewildering, as we all felt the fabric, jaws open, and tongues hanging out. The effect was mesmerizing, but we needed lunch. Dave has some interesting YouTube videos to watch about his sailboat racing career; other websites are the Volvo Ocean Race in particular, in Team Alvimedica. 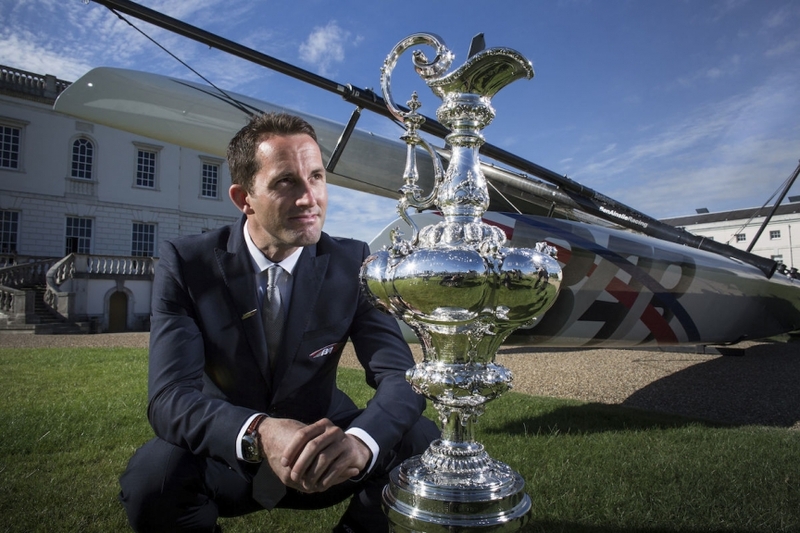 Dave gave us an insight into what it’s like to be a long-distance racing sailor. With each race-leg being typically 25 days away from home, it’s not necessarily something for a person with a young family…or for somebody who likes their bed!! 4 hours on-watch, 4 hours off-watch (if you're lucky), hot bunking, cramped conditions. It was a very interesting talk….and we got a hat !!! After a short coach trip to the other side of the harbour we arrived at Gunwharf Quays Shopping Centre in Portsmouth (now, that’s a day trip in itself for shopaholics), where the Spinnaker Tower is located. On a good day, you can see over 35 miles, but today we could only just make out Ryde on the Isle of Wight, but the view was still pretty impressive, as you can see from the collection of pictures, below. Everyone had a great day out. The coach trip provides an excellent opportunity to chat with friends, and GXSA day trips are a fantastic opportunity to renew and make new friends. Come along on the next day trip. You'll have a great time!! Thanks Bernie, Dave, and North Sails. We had a great day out. The coach will depart from Gerrards Cross Memorial Centre at 09:00 to travel to North Sails (Gosport), where we will have a tour of the sail loft. Everything from dinghy sails to sails for superyachts is made here. There will then be a light lunch (included) and a talk by North Sails about Volvo racing and the design of your sails. Following this we will go to Gunwharf Quay, where we can go up 100m in the air to see amazing views of Portsmouth harbour from the Spinnaker Tower (weather permitting), sit in a pub or go shopping in the Outlet stores. The cost is £20.00 per person. The cost of going up the Spinnaker Tower will be extra, since it is dependent on weather. If we have more than 15 definites for the Spinnaker Tower, regardless of the weather, a group booking at reduced prices will be possible at £7.45 for seniors, £8.35 for adults. Alternatively you can pay for the Spinnaker Tower independently - it costs £11.00 on the day or (if you book online the day before) £9.00 for seniors, £9.90 for adults. Closing date for bookings and payment is 28th February. • Tickets are Standard Entry tickets and valid for ANY one day of the Show. • Tickets can be ordered up to 23:59 on Saturday 22nd September. • A SINGLE transaction fee of £1.99 applies whether ordering one or more tickets. • Youngsters 15 years or under go free (up to 2 per accompanying adult) if their tickets are requested when ordering adult tickets. • Tickets are only available as ‘Print at Home’ via TheYachtMarket.com Southampton Boat Show website. • Click on BUY TICKETS at top of homepage. • Enter and submit Promotional Code. This will bring up the ticket ordering sequence which is straightforward to follow. • You may be asked to select the day you expect to visit. This is merely to help predict visitor numbers. Each year in April after the AGM and close of the Spring Talks programme, GXSA holds an annual dinner which has approximately a hundred attendees. There is a prestigious speaker from the world of sailing who also awards three silver trophies which have been donated to the association by past members who have been most appreciative of the companionship they have enjoyed during their membership. GXSA Rally Regulars (plus some very welcome first-timers) met at Chichester Marina, on the south coast, for the Mid-Summer Rally. Dinner was held at the new facilities of Chichester Yacht Club. The weather, location, welcome, accommodation, facilities and food were all first class. Many thanks to Stuart for organising us. On the Sunday morning, some went to Chichester cathedral, some walked to Dell Quay sailing club and some stayed in bed. What is the Crew List? It's a way for Skippers to offer berths for short-term or long-term trips, today, tomorrow, next week, next month, etc.. It's a way for Crew to get in-touch, and.or keep in-touch. Only GXSA members registered as members of Crew-List can send messages. Only GXSA members registered as members of Crew-List can receive messages. It's a closed group. Messages sent by people that are NOT members of the group will be deleted, and not forwarded. Messages sent to the group will be monitored - please respect other members and be aware of their sensibilities. Users that are disrespectful will be discontinued. Always rememeber that you are being invited to join the skipper in their own yacht (it's not a charter). Remember that you are being invited into their home, and respect it as such. If you would like to join the proposed trip, reply to the message, and hopefully the skipper will get back to you with a confirmation. The Skipper should have included contact details in the email. If not, look at the "Reply-To" email address, which will be the author's email address; be sure to reply the the correct address. NB: We've setup the system so that the reply-to address is correct. However some email clients ignore this when you reply to an email, and just reply to the from address..which is the email group. Please be careful when replying. Be sure to include whatever contact details you like in the email body (email, phone, etc.). Your email address will be used as the reply-to address, so respondents can message directly back to you (and not the group); however if respondants just hit Reply the message may go to the group. If you get too many responses, please make sure that you contact all the unsuccessful respondents. Please respect that people are responding in the hope of a good experience. We aim to reinforce the GXSA experience, so please respond to each message. Skippers and Crew need to sign up to use the Crew List. Sign-up to this system is entirely under your own control - GXSA will not sign you up automatically. By signing up, you agree for the details you provide in emails to be published to all the GXSA members on the list. To sign up, you simply need to login to the GXSA website, then start the "My Mailing Lists" option on left hand "User Menu"
Next, simply click the "Crew List" button to "Yes", and then "Save" the updates. Now, you will receive all messages that are sent by your fellow members of the email-group. You can post to the group, and receive messages from the group. For lovers of French Cuisine (Brexit notwithstanding), the initial plan is rendezvous in St Peter Port, and day-sail along the Brittany coast, aiming for Morlaix, then heading home from there. Once or twice a year, GXSA organises training courses for the benefit of its members. These are usually "one day events" held on a Saturday which cover various topics according to demand. Where appropriate, these have the benefit of RYA approval and certification. Topics have included: astro navigation, radar, knots and splices, diesel engine maintenance, boat electrics, GRP repairs and first aid. These are significant one day events organised around a particular topic and open to a wider audience than GXSA members. The last event was in Autumn 2011 when Jimmy Cornell, author and highly experienced yachtsman explained the intricacies of Ocean Cruising. It was very well attended. Our locally based RYA approved sailing school Westview Sailing gives RYA and VHF/DSC radio courses courses locally. The proprietor, Duncan Wells is a long-standing and well respected member of the association and an occasional contributor to the yachting press. His courses make ideal presents for "those that have everything"! Follow link or telephone Duncan 01753 890555 for details of forthcoming courses.